A pizza pie, that is. We used to mostly just eat pizza at a pizzeria or out of a delivery box, but now with so many more options for ready-made crust, it’s become one of our favorite things to make at home. Before we discovered the refrigerated dough from Fresh and Easy, making pizza at home was this time-intensive process of making the dough, waiting for it to rise, and doing all this work before even getting to the fun part, which is putting on the toppings. It was always worth the effort, but one of those things we just didn’t do very often because of the time involved. But now, skipping all those dough-preparation steps gets us to the part we like faster—putting on the toppings—which is probably why pizza has been on the menu every week for the past month. We’ve tried both the whole wheat and regular versions, and I think the regular dough comes out a bit crispier and crunchier (a good thing when making a thin crust pizza). However, even though this pizza is easy, it’s not without challenges. After letting the dough sit out for about 20 minutes before rolling out onto a pizza pan or stone, we face our first dilemma: deciding which toppings to use. Our problem is that we always put on too much. I’m convinced that my beautiful thin crust can’t stand up to the mountain of toppings always covering it, but it seems to be working out ok. We bake the pizza longer than the suggested time of 10-15 minutes (about 20 minutes total) to get the crispy crust we like. So, for about 10 minutes of work and some waiting time, we’ve got a simple, delicious dinner. 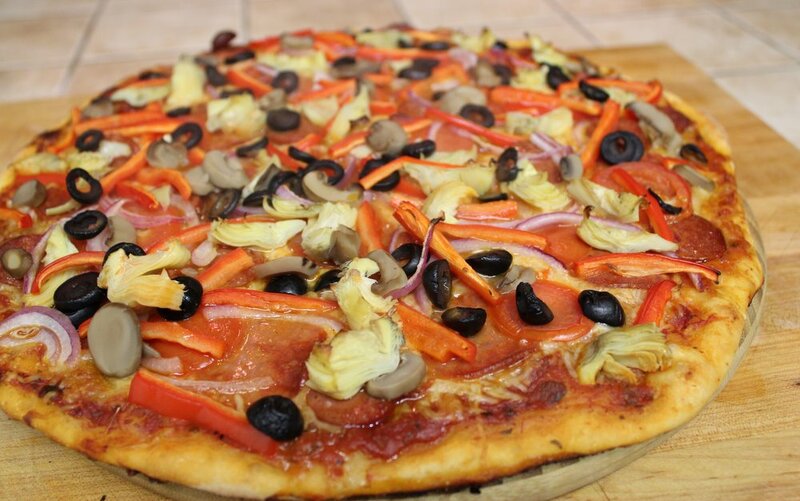 After topping with tomato sauce and cheese, the last pizza included: turkey pepperoni, spicy pork sausage, red onions, black olives, red bell peppers, mushrooms, and artichoke hearts. You could hardly see the cheese underneath! Jan says you can’t have too much of a good thing, but I think our next challenge will be pizza topping editing—paring down to fewer ingredients to get the best balance of flavors. I’m always impressed by different and unusual combinations of toppings, but it’s hard to get out of our “combination” routine. What other favorite pizza topping combinations should we try next?